You can add your own homemade meatballs to spaghetti sauce. So good, your family will be asking for the recipe. Coat a large cookie sheet with cooking spray. In large bowl, combine ground beef, seasoned salt, black pepper, garlic powder, greek seasoning, bread crumbs, egg, water, olive oil and toasted chopped onions. Mix well, and form into 12 meatballs and place on prepare cookie sheet. Place under broiler, until brown, about 5 minutes. Turn, cook additional 4 to 5 minutes, until no longer pink. In large sauce pan, place enough olive oil to cover bottom of pan, heat over medium heat. Saute onions and garlic, until onions are translucent. Stir in spaghetti sauce and bay leaf. Simmer 10 minutes. 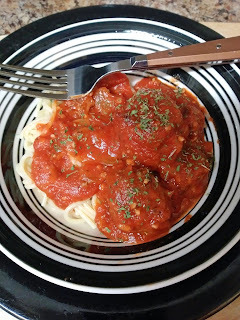 Transfer meatballs to spaghetti sauce, simmer additional 10 minutes. Remove bay leaf. Serve.